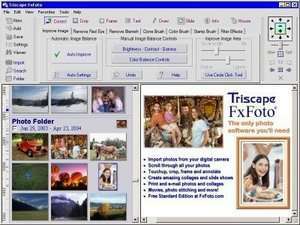 Triscape's FxFoto Provides a single tool to automatically organize, archive, enhance, and create collages with your digital photos. FxFoto was designed to give the novice to advanced amateur a simple and easily navigable package to address all the common photo software needs as well as offer unique features that help you publish and preserve your photographic memories with style. Some of FxFoto's many features include automatically locating all your current photos, direct import from virtually any digital camera or card reader, visual grouping and organizing photos, and a host of processing functions to spruce up pictures, including red eye correction, lighting and image enhancement, and blemish removal. For security reasons, you should also check out the FxFoto download at LO4D.com which includes virus and malware tests. Additional screenshots of this application download may be available, too. FxFoto has a presence on social networks.